I admit I am fascinated by old time strongmen. 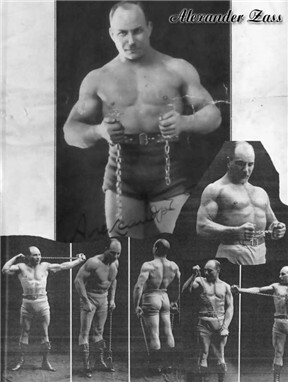 One of my favorite is Alexander Zass, The Iron Samson. Born in 1888, Zass served in World War I in the Russian Army fighting against the Austrians. He was captured as a prisoner of war four times, escaping each time. His secret for escaping prison? Snapping chains and bending iron bars with nothing but his bare hands. Seriously. After the war he became a circus performer, since YouTube and reality TV hadn’t been invented yet, and took his iron bending act on the road. He advocated isometrics, where you strain against an immovable object (like prison bars) every day. Repeat until strong. I’ve practiced isometrics. After I hurt my back many moons ago I used isometrics and other bodyweight techniques to patch myself back into strength and health. (OK, I have yet to bend iron. I bent a spoon once, and I’ve snapped plenty of cheap plastic sporks in my time though). The trick with isometrics is that it’s not the most exciting thing on the planet. You strain as hard as you can for 15 seconds or so and nothing happens. Then you reposition your hands or feet and strain again with the same result. Nothing. The next day you will do it again, and nothing will happen again. Two weeks from your start you will strain as hard as you can and again, the door frame will still be there. The rope I used for different angles never snapped. Day after day. Nothing. And your calorie burn from such exertion is not enough to burn off a Pop Tart. It can be discouraging. It requires discipline to stick with it as a daily practice. The daily discipline of walking with Christ can be quite similar. Daily bible study, praying every morning, going to church every week and, like isometrics, nothing happens. Nothing changes, sometimes for months. It can certainly seem that way. But the magic of Isometrics is the small changes in your muscles every day that build into real strength. The magic of discipline in the Christian life is the small changes in your character, in your “core” that build up from daily pressing forward into a life with Christ. Peter writes of this change, piling knowledge onto self-control onto patience, on top of godliness, kindness, love. These qualities keep us fruitful and useful in the knowledge of Christ. And that knowledge allows Christ to come more fully into our life, and break the chains & bend the bars that enslave our heart and life. Please share this if you liked it. That’s why those buttons are over there. Thanks.